I cried a lot of tears last night. I turned away from the TV or left the room several times each because I just couldn’t bear the pain I felt over what was being played. The real-life events mixed with my own faint early-childhood memories as I tried to recall my own experience as a witness to one of the most amazing things that happened in this country. The film we were watching? Terry. In my hometown of Port Moody, you’ll occasionally come across signs like this one. Though Terry Fox came from Port Coquitlam, two towns over, he often used the hilly streets of rural Port Moody to train in the days that led up to his 1980 Marathon of Hope. As a young family, we’d often pile into the car on a Sunday afternoon and go for a drive. Sometimes we’d end up in Ioco and Belcarra to visit the parks and beaches in the area and it was there that we saw Terry Fox running along the side of the road. As we approached him, we would stick our heads out the window and cheer him along. Unlike other areas across the country and likely due to our proximity to Terry’s home, we were very much aware of his plans to cross the entire country of Canada on foot with the goal of raising money for cancer research. Though we were only young, my classmates and I drew pictures for him and sang songs about him in school. We tracked his journey as news of his progress came in and we always spoke about him with great pride. We were devastated when he had to stop and fly home because the cancer had spread. I’m sure that, as young as we were, we couldn’t even comprehend the reality of what was going on, but we were entirely devoted to Terry Fox. After his death, participation in the Terry Fox run was mandatory for the entire duration of my schooling. It was held during the month of September and thirty-three years later, I can’t help but think that must have been meant to symbolize that we were carrying on in his quest, the one that ended on September 1st, 1980. Thirty-four years ago today, Terrance Stanley Fox passed away with his family by his side in New Westminster, BC. Watching that movie last night then talking about it with several people from all across the country reminded me of just how special a time that was and, though I find it incredibly moving and sad and inspiring all at the same time, I’m thankful to have been aware of it while it was happening and to have memories from that time. If you’ve never heard of Terry Fox or are hazy on the details of the Marathon of Hope, watch this nine-minute video that includes real footage of his journey. I hope it will help you understand why he is such a valuable part of Canada’s history. “It occurs very rarely in the life of a nation that the courageous spirit of one person unites all people in the celebration of his life and in the mourning of his death … We do not think of him as one who was defeated by misfortune but as one who inspired us with the example of the triumph of the human spirit over adversity”. Though Kevin was aware of Terry Fox, having grown up in Ontario and being a few years younger, he didn’t know the full story until last night. We both feel inspired to take part in the Terry Fox Run celebrating 35 years since Terry set out to cross the country on September 20th this year. If you’d like to join us, let me know! If you’re not in the neighbourhood, there are hundreds of events going on in every province and territory. Here’s a link to help find one near you. 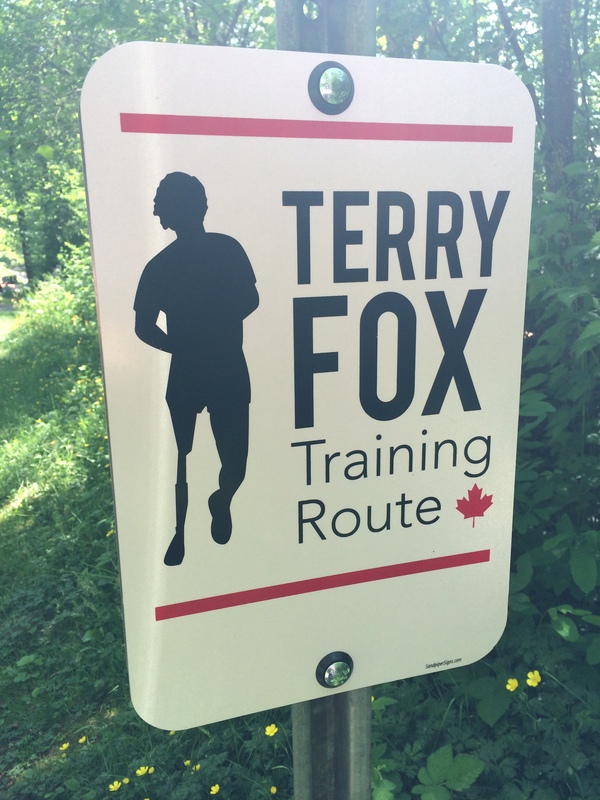 Terry Fox run is one of my charitable accounts and one I’m so proud that we, as a small business, can support. So happy you’re participating in the run! I can assure you the head office team in Toronto are a fantastic bunch and work hard liaising with teams across the country.